The Huffington Post reports that a Georgia restaurant that was criticized this weekend for suggesting that a "Caribbean Black and Bleu" sandwich was inspired by Chris Brown's 2009 assault against Rihanna has taken it off the menu. And it suddenly no longer thinks that domestic violence jokes about the two singers are funny. According to the paper, an affiliate of the Watkinsville, GA restaurant tweeted a photo of what they called the "Caribbean Black and Bleu" sandwich, announcing that “@chrisbrown, @rihanna and us teamed up for a award winning celebrity sandwich. “Chris Brown won’t beat you up for eating this unless your name starts with a R and ends with A,” the tweet said, though it appears to have been removed from the restaurant's Twitter account. 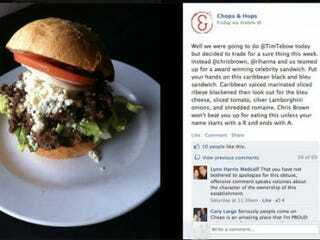 In response to criticism that the menu item was in poor taste, the restaurant pulled the sandwich and issued a statement on its Facebook page, denouncing domestic violence and touting its support of an advocacy group called Project Safe Team 6: "The owners of C&H would like to make sure everyone knows that we and our staff DO NOT SUPPORT DOMESTIC VIOLENCE. Many of us have been affected by domestic violence in some manner and realize that this is no joke. We have been involved in fundraising for Project Safe Team 6 and we fully intend on donating proceeds (times 6 - in honor of Team 6) from the sales of the burger. C&H continues to strive for a community driven, family oriented, great food and great service environment. We will continue to be involved in our community fundraising and charities near and dear to our hearts. Mychell Lang."